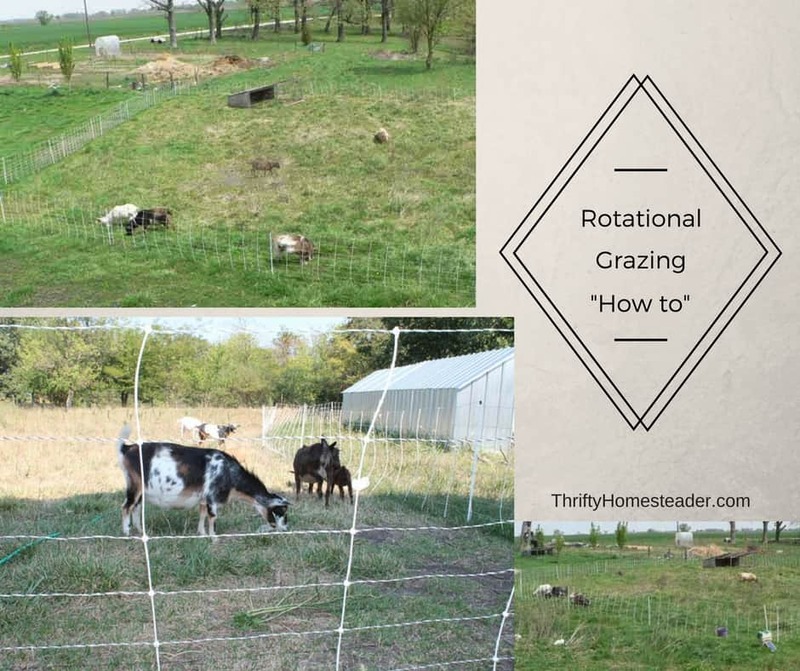 Rotational grazing: How do you DO it? You’re sold on the benefits of rotational grazing, but you’re not quite sure exactly how to do it. 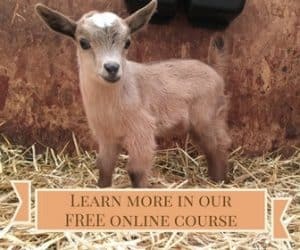 You can’t create a door from your barn directly into each pasture, so how do you get your goats (or sheep) to the area where you want them to graze? We rotate our does all over our property, and sometimes that means walking down our driveway to the area that we have fenced in with Electro-Net across the yard from the barn. If you only have a few goats, you could simply put a lead rope on them and walk them to their new area a few times. However, we have had as many as 22 adults and 60 kids to move, and it would take a long time to move them individually. So, what do we do? We start by putting a pan of alfalfa pellets and grain in the area where we want them to go. Then we put alfalfa pellets and grain into a feed pan or bucket, open the door to their stall, and hold the pan in front of them so a couple of them can get a bite or two. You walk slowly holding the pan of feed where they can see it, sometimes letting them take another bite or two, if you need to do that to keep them following you. If one is falling behind you may have to leave it behind for now. If you try too hard to keep them all together, you risk having the ones in front eat everything in the pan before you get to your destination. Go ahead and take the ones who are following you and get them into the area where you have the pan of grain and alfalfa pellets waiting. Show them the pan(s) of feed sitting in the pasture, and they’ll start eating it while you go back with your pan of grain to get the other goat(s) that fell behind. The young kids are the hardest. If we didn’t have so many, we’d just pick them up and carry them! But even the littlest kids get it figured out in a few days, especially if they’re dam-raised because they learn to stick to mom. Getting them back into the barn at night is much easier because they want to go into the barn at sundown. This is especially true if you have does in the group who’ve been living in the barn for a couple of years. They know where home is! If you try to do it much earlier than sundown, they won’t be as eager. After doing this for three or four days, you won’t need to use the pan of feed to get them to follow you. They’ll know that there is a pan of feed waiting for them in the grazing/browsing area in the morning and in the barn at night. Don’t be tempted to stop leaving the feed in the pasture for them. For the number of Nigerian dwarf goats we have, we put out three pans. 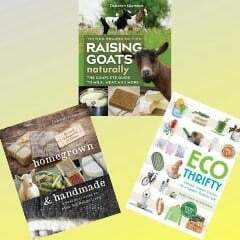 If you have five or less goats, you can probably put out one pan of feed. The more goats you have, and the larger they are, the more pans of feed you need to have in the new area so that they will stay busy eating it until you get everyone in there. In each pan of grain I put 5-6 cups of alfalfa pellets and 1 cup of goat feed, so the actual amount of grain that each goat is getting is almost nothing — 2-3 tablespoons. If your goats are not milking, you can use grass hay pellets, such as orchard grass or timothy pellets. They are made by the same company that makes the alfalfa pellets in our area. If you don’t have a lot of goats or a long distance to go, or if you can run as fast as your goats, once they get the drill, you may not need to use much for hay pellets. I just use that much because I’m really slow, so that’s how much I need to have in the pan for them to still have their noses stuck in it by the time I get there to close the door of the barn stall or close the gap in the Electro-Net. Also, be sure that they’ve had hay pellets before you try this. They will only follow you if they really want the food you have. That’s why I have to sprinkle some goat grain on top. Most goats are not immediately big fans of hay pellets. It takes time for them to start liking them, and some never seem to become fans. However, when there is competition for food, they are always more interested in it. So, they are more likely to want it if there are other goats around than if you simply offered it to them in a pan when they are alone. Thank you for the information. I was curious as to why you used the hay pellets as opposed to the alfalfa pellets with your does in milk? Thanks for asking. I do use alfalfa pellets with does in milk. Hay pellets could be alfalfa hay or grass hay. I sometimes wrote “alfalfa” and sometimes wrote “hay” to avoid sounding too redundant. Thank you. I’ve enjoyed all of your articles and information. Specially the copper research, survey and recommendations. I also believe in the benefits of copper. I do bolus my Nigerian dwarfs every 3 to 6 months. Perhaps this would make for an interesting forum topic? Is it cheating to give the goats cheerios (maybe 3/goat) instead of pellets and grain? I ask only because my goats already know that when I shake the cheerios container, it’s treats time and they all come running. They haven’t had pellets in the past, just straight grass hay. 3 per goat per day wouldn’t be bad.